Pinball is something Linux has been lacking in variety, so it's pleasing we get another! Pro Pinball Ultra is now officially available on Linux & SteamOS. Since it's in Early Access I will likely leave any proper thoughts on this one until it's finished. If you pick it up, be sure to let us know how it runs! 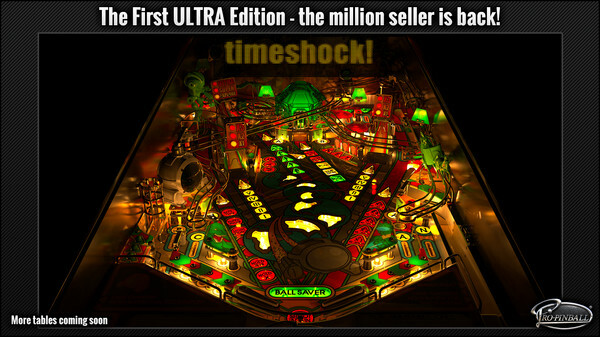 - The ultimate pinball physics engine! - More content packed in than many regular tables put together - Multiballs, Wizard Modes, Video - Modes, Spinners, Jet Bumpers, Magnets, Drop Targets and just about everything else you can imagine! I love pinball, this one looks good. I like that. Will also wait for the full release, or a nice rebate. There is no question. The pro pinball series was and still is up to today one of the best pinball series on pc. 15 bucks might sound much but and maybe for some people who just want to play 1 round and put it away again it is. But everyone who likes to master a table and highscores go grab it. The pro pinball tables are so well designed with so much stuff to discover it's realy worth it. After the praise -> it's early access and while the table itself the menus feel like early access. For example there are only 2 viewangels at the moment and you can't change them on the fly. I hope for the future of the product and i can't wait for them to release more tables from this series. Bought -> played -> and fall in love again. Initially it's a bit odd. First you download the steam game. Then it starts downloading table from within the game. I changed the viewing angle and it started downloading again. Both downloads specifically for my resolution. Of course, like anyone, I expected the table to be 3d model. But this proves it's actually a pre-rendered view. The big advantage is that it looks absolutely perfect. But you are restricted to the views they give you, which is currently only two of the five. I found another disadvantage. After 15 years without Windows, I'm thoroughly out of practice on pinball games. Pinball with steam controller feels great. Picked up Hyperspace Pinball a few days ago, I do like how this one looks though since its easier to follow with all the color. I used to play Pinball Dreams and Pinball Fantasies so much on the Amiga in the mid-nineties that I'm still pretty much burned out on pinball. In fact most of my family was hooked on them. tuubi In fact most of my family was hooked on them.